The Sharp AL-2030 is an advanced, straightforward solution for business requirements. With the potential to dish out fast prints and copies, the printer is convenient to use in various projects. The MFP is designed to handle media types and sizes to facilitate performance for homes and offices processes. The Sharp AL-2030 MFP utilizes laser technology in its prints and images to improve the quality. With reasonably fast copy-rates of 20 pages per minute, and print-rates of 16 pages per minute, somewhat busy office environments will be satisfied. The 50 page ADF will duplicate large documents swiftly. The 250-page tray will present usefulness in large print/copy jobs; it can handle various paper types and sizes. The zooming feature will enable the user set it up in increments of one. The maximum enlargement is 400%; the maximum reduction is 25%. Special paper and sizes can be utilized in the bypass tray; the bypass tray can hold up to 50 sheets. With the manual, photo, and auto exposure modes, one can produce exact copies of their documents perpetually. A limited warranty for one year of replacement parts and one year of labor are available for the printer. If anything malfunctions with the printer within a year of its purchase, just contact Sharp and they will fix it for you. 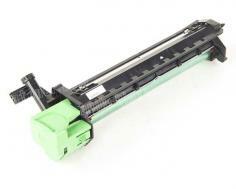 The printer weighs approximately 38 pounds; therefore, the printer is relatively lightweight. The width of 20.4 inches, depth of 17.5 inches, and height of 14.1 inches make it a proper fit for any medium-desktop. The warm-up time is roughly 30 seconds, and the first copy will take eight seconds to generate. There are 18 rapid keys for quick dialing, and up to 81 speed dials. 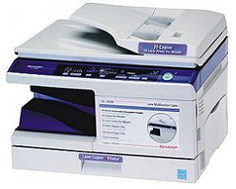 The scanner presents the capacity to scan a document and print it several times. The printer is compatible with mainstream Windows Vista, Windows XP, Windows 2000, Windows ME, and Windows 98. The printer hooks up directly to nodes via USB cable and port. The copy feature can be set to run continuously with a copy speed of 20 pages per minute. The printer language is host-based, and the resolution is 600 x 600 dots per inch for copy and prints. The machine will dish out prints of up to16 pages per minute. One can set the printer to make up to 99 copies of a document; after which, the copy process has to be done all again. The Sharp AL-2030 can handle a maximum media size of 8.5 x 14 inches; the minimum size is 3.5 x 5.5 inches. Various transparencies, plain-paper, and envelopes can be utilized within the printer. 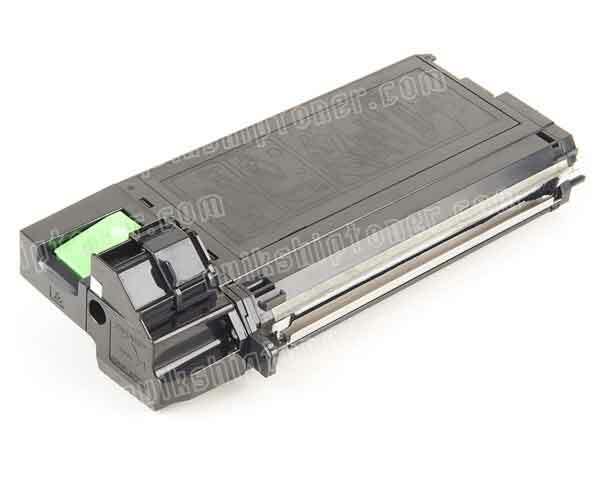 Rest assured, Sharp guarantees the printer to be energy conservative with maximum power consumption of 30 watts. If your business applications focus on the manufacture of printed, black & white documents, this will be a solid printer for you. The 2-in-1 copying is not available for the Sharp AL-2030. There is no built-in digital answering system. The worst thing about the scanner is it only scans in black & white. There are no color capabilities present in the print, scan, fax, or copy features. The compatibility of the printer limits itself to Windows; there is little evidence the printer will work with Macintosh, Linux, and Unix operating systems. Dual copy, center/edge erase, margin adjustment, Y-X zoom, and negative/positive reverse are not facilitated on the printer. Businesses need the ability to network; the MFP does not facilitate a network interface. While the printer is a strong printing/copying machine, color printing and scanning is not incorporated. Review it: "Sharp AL-2030 "
The Sharp AL-2030 is compatible with AL-100DR drums. The genuine drum cartridge will yield up to 18,000 pages; the AL-110TD toner will yield 4,000 pages; the AL-100TD toner will yield 6,000 pages. Various toners that are not genuine will be significantly lower in price. Genuine Sharp AL-100DR drum units will yield 18,000 pages. Compatible drum kits will generally cost much cheaper.